Office Supplies Talk: A Fridge That's More Than Meets The Eye. One of the most interesting products that has crossed our paths recently is the MicroFridge Garage Refrigerator. 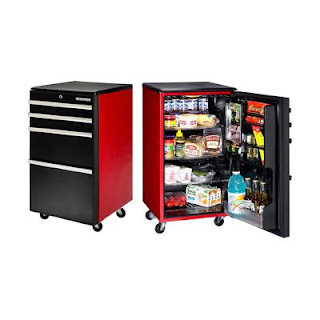 A mini-fridge that is designed to match the look and feel of the tool chests in your garage. At first glance anybody would assume it is just another boring metal box used to hold screwdrivers, or spare chainsaw parts but upon pulling the handle they'll find a new surprise. The door will swing open to reveal a treasure trove of whatever goodies you decide to keep in there. The garage is a great place to keep a few beverages for when you need to take a break from fixing up your old Mustang. Weather you get a hankering for a simple cola, a brew made from fermented starches, or a tall glass of soy milk, the fridge won't discriminate. You won't have to worry about wiping greasy hand prints off the door-knob or the fridge in the kitchen when you keep your cooled beverages in the garage and that'll save everybody a lot of time and hassle. On the off chance that you share a garage with a group of other beverage seekers there is enough room for a few 2-liter bottles and has a convenient can dispenser. Once that same group of beverage seekers has worn out their welcome you can easily lock your garage refrigerator and take the key with you. If that group of beverage seekers is particularly rambunctious or thrill seeking you'll be glad to know that it also has a set of casters so you can roll it out of harms way. Alternatively, a fridge on casters could be its own entertainment. While I don't condone it, and I haven't tried it I could imagine a nice long extension cord and rather than just taking a can of cola out of the fridge and passing it around, why not just pass the fridge around and let everybody take their favorite. I could also imagine an awesome project where you could tack a motor onto the back and automate beverage delivery.